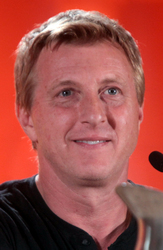 Billy Zabka is an American actor, screenwriter, director and producer. He is best known for his villain roles in several iconic 1980s films, such as his role as Johnny Lawrence in 1984's The Karate Kid. In 2004, he was nominated for an Academy Award for co-writing and producing the film Most.